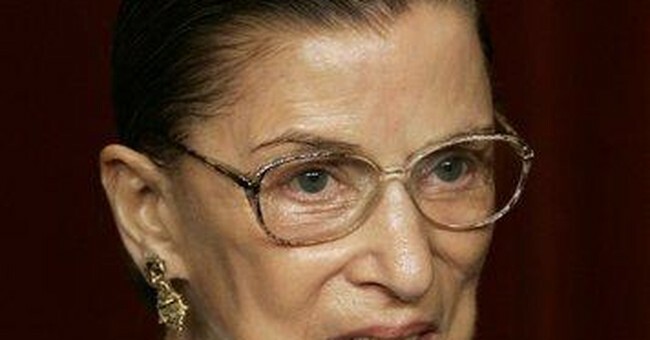 Justice Ruth Bader Ginsburg is being treated for pancreatic cancer. While Americans pray for her recovery, this sad news is a sobering reminder that President Obama is likely to appoint several justices to the U.S. Supreme Court. And in the aftermath of last year’s landmark decision on the Second Amendment, gun owners need to zero in on what these events mean for the future of the right to bear arms. Last year the Supreme Court held in D.C. v. Heller that the Second Amendment secures the right to bear arms for individual Americans. In doing so, the Court rejected the view put forth by liberals that the Second Amendment only empowers state governments to equip their National Guard units. But too many lose sight of the fact that the Heller decision was a 5-4 decision. Four justices - only one short of a majority - adopted the liberal argument that the Second Amendment does not involve any rights whatsoever for private citizens. The Second Amendment was only a single vote away from being eradicated from the Constitution. Justice Ginsburg was one of those four. Fortunately for Justice Ginsburg, the doctors detected the cancer in its earliest stages. But pancreatic cancer is among the most aggressive types of cancer, and even with early detection and immediate surgery her recovery will probably require her to step down. President Obama will likely have to nominate someone to Justice Ginsburg’s seat before his presidential term is finished. This is a reminder that one of the most consequential things a president does is appoint federal judges, especially those to the Supreme Court. All federal judges serve for life, and they wield the power to authoritatively interpret and apply the Constitution as the supreme law of the land. It is quite possible that President Obama may exercise his appointment power to fill Supreme Court vacancies as many as three times before the 2012 elections. That being so, legal circles are all abuzz right now about whom President Obama is likely to appoint, either to Justice Ginsburg’s seat or to other seats on the high court that may open up soon. Several judges from the federal appeals courts come up repeatedly, as do several names from elite law schools. Three people in particular are getting close scrutiny this week because their names are before the U.S. Senate. Mr. Obama has nominated David Ogden, Elena Kagan and Dawn Johnsen to be deputy attorney general, solicitor general, and the assistant attorney general in charge of the Office of Legal Counsel (OLC), respectively. These positions, in addition to being three of the highest-ranking posts at the Justice Department, are also common stepping stones to the U.S. Supreme Court. The deputy attorney general is the number two at Justice. The solicitor general is the lawyer who argues for the government in the Supreme Court when the United States is a party to a suit. And OLC issues official legal positions for the federal government. Each of them - Mr. Ogden, Ms. Kagan and Ms. Johnsen - are committed liberals whose views on a whole range of issues are on the far left. Each of them could argue anti-gun views in our federal courts, and if any of them end up on the bench, could enshrine those views in the law books. In the aftermath of the Heller decision, there will be a handful of major Second Amendment cases over the next few years that will shape gun rights in this country forever. In fact, it was a pro-gun 2004 OLC opinion that laid the foundation for gun-rights advocates to win the Heller case. Of all these issues, the most significant is whether the Second Amendment only protects gun owners from the federal government, or if it also applies to states and cities. Liberals argue that the amendment only limits the federal government. There are two major lawsuits underway right now, both of which could go to the Supreme Court. So gun owners had better beware, and should be urging their senators to ask these nominees tough questions on the Second Amendment. Separately, last week’s news regarding Justice Ginsburg reminds us of what is important. Even the most powerful people are still only people, with every human frailty. Justice Ginsburg is a cancer survivor, and we can all hope that she defeats cancer again. Justice Ginsburg has led an amazing life filled with historic accomplishments, and millions of Americans offer their prayers for her and her family.